Firefighters work outside of the Loy-Lange Box Company building on South 3rd Street. 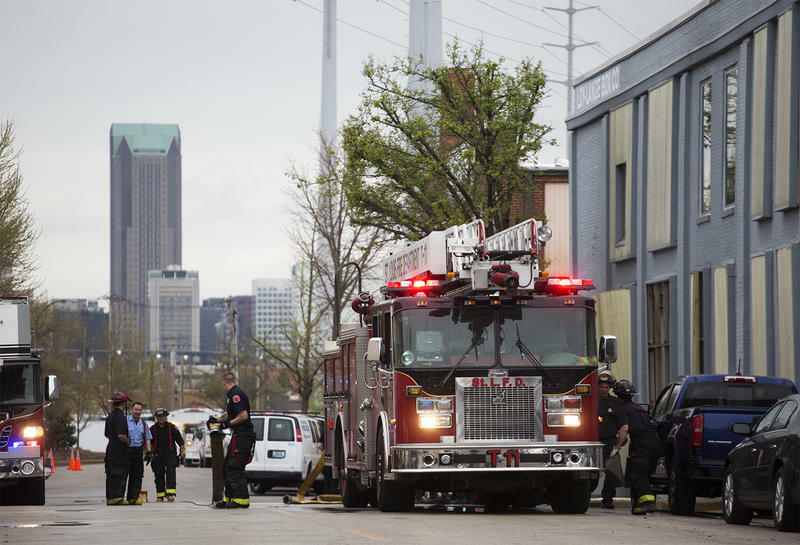 Updated at 10:25 a.m. April 6 with confirmation of fourth death — The death toll has risen from this week's boiler explosion at a factory in the Soulard neighborhood. The St. Louis Metropolitan Police Department said Clifford Lee, 53, died on Wednesday. Lee was inside the Faultless Linen Company when a piece of the boiler that exploded at the Loy-Lange Box Company crashed through the roof. The St. Louis Post-Dispatch reports that Lee was a new hire waiting to fill out paperwork. Two others inside Faultless, Tonya Gonzalez-Suarez, 43, and Christopher Watkins, 46, died Monday. Kenneth Trentham, 59, died in the initial explosion inside the Loy-Lange Box Company. One other person remains hospitalized. Three people were killed Monday morning after a boiler at the Loy-Lange Box Company in the Soulard neighborhood exploded, then flew more than a block before landing on another business. St. Louis Fire Department Chief Dennis Jenkerson said one person died near the boiler at the box company, 222 Russell Blvd. Two others died at the Faultless Healthcare Linen at 2030 S. Broadway, when the boiler crashed through the roof. “This was a large boiler. The piece that went through this roof here [Faultless] was the size of a full-size van, and this is all heavy-cast iron,” Jenkerson said. He said four other people were taken to a hospital; two were in critical condition Monday morning. Loy-Lange Box Company employees watch as the fire department assesses damage. Officials from the Occupational Safety and Health Administration say the Loy-Lange Box Co. have paid fines for violating workplace regulations three times in the past three years. One in August 2016 for $3,741 after inspectors found holes in floors that prevented proper cleaning. Inspectors found damaged and defective equipment in November 2014, fining the company $6,566. And in February 2014, the company paid $2,450 for violating procedure protocols, like not properly training employees to check if machinery was powered down. It's unclear if any of the earlier safety violations involved the boiler. Carl Littrell has worked at the Loy-Lange box company since 2002 operating the machines that print, fold and glue the company’s products. He was just starting his day when the explosion happened. Emergency responders received a call just after the building explosion. “This was a very hectic scene with three different buildings at the same time. It called for a lot of equipment, a lot of manpower to get this under control quickly,” Jenkerson said. The Pioneer Industrial Company building at 400 Russell Blvd. also was damaged by an 8-foot long pipe. More than a dozen employees stood by as debris was removed from the roof of their building. Responders coordinate as Pioneer Industrial Company employees gather in the company's parking lot on Russell Blvd. Jenkerson said the fire department’s investigative unit was on the scene and will be looking into the maintenance schedule of the boiler. “It takes a licensed boiler operator to operate these things, so we’re going to be looking at all the records to make sure everything was up-to-date,” he said. A couple dozen Faultless Healthcare Linen employees gathered in the parking lot of the nearby St. Louis Bread Co. Employees from both companies were directed by managers to not comment on the explosion. All the affected buildings were secured before 10 a.m. Firefighters head into the Pioneer Industrial Company building on Russell Blvd. On the south side of the Loy-Lange Box Company, about 15 employees gathered to watch recovery efforts by the fire department and console each other.